Hey golfers! Golf is great, right? So, want a chance to win $10,000 cash plus a vacation to the golf capital of the world? Then, tell Myrtle Beach Golf Holiday why you love the game so much during the Myrtle Beach Golf Is Great Video Contest 2017 at GolfIsGreat.com! One golf lovers will receive $10,000 cash and an all-expenses-paid golf getaway for four to Myrtle Beach including accommodations and 3 rounds of golf. We know you love the game! Now you have 3 minutes to tell why for a chance to win! In order to participate, you are required to upload a video. During the Contest Period, grab your clubs and some buddies then head out to the course and shoot a short video telling what keeps you coming back for more. Nothing fancy is required. But the more personality and originality, the better. Then, post your video to YouTube using #GolfisGreat and enter at GolfIsGreat.com for a shot at the grand prize. Complete the entry form including your video’s embed link from Youtube and submit. All video submissions must be received by July 31, 2017 at 11:59:59 PM ET to be eligible. 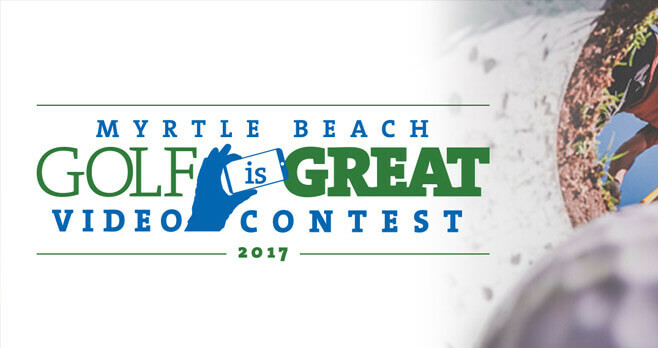 The Myrtle Beach Golf Is Great Video Contest is open only to legal residents of the 50 United States and District of Columbia, and Canada and must be 18 and older (or 19 and older for residents of AL and NE) at the time of entry. The Contest begins on June 6, 2017 at 12:00:00 PM ET and ends on August 31, 2017 at 11:59:59 PM ET. The winner will be announced on or about September 1, 2017. For the Contest Winners’ names (available after September 1, 2017) send a hand-printed, self-addressed, stamped envelope by September 15, 2017 to: Winners List/Official Rules (designate which), Myrtle Beach Golf Holiday – Attention: Morgan Dendy, 1705 North Oak Street, Suite 6 Myrtle Beach, SC 29577, all Winners List and Official Rules requests made by mail must be received by September 15, 2017 . This Sweepstakes is sponsored by Myrtle Beach Golf Holiday 1705 North Oak Street, Suite 6, Myrtle Beach, SC 29577. For complete details, including Official Rules, visit www.GolfIsGreat.com.